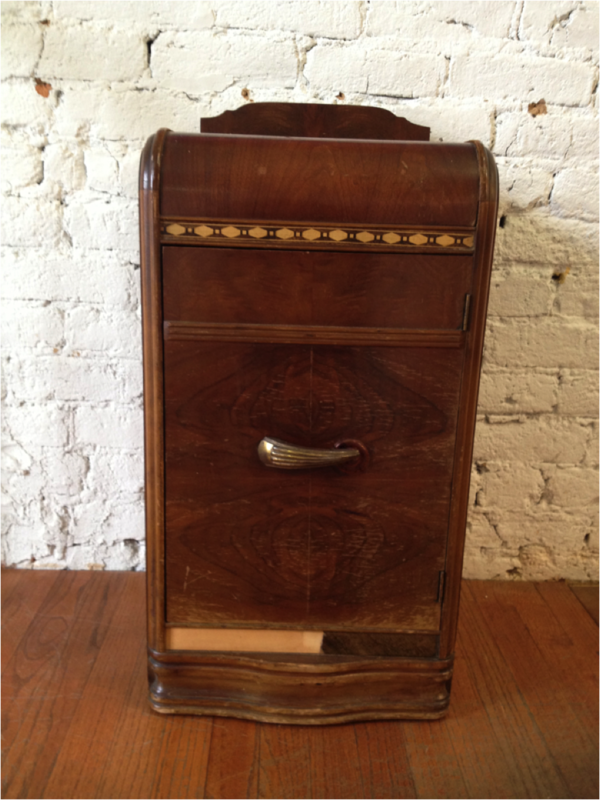 Do you wish to update some furniture in your home? This fun craft project “upcycles” furniture and other material in a budget- and eco-friendly way. When you’re finished, you’ll be rewarded with an original, “new to you” piece of furniture to enjoy, sell, or give to someone. Here is the side table “before” refinishing with paper. 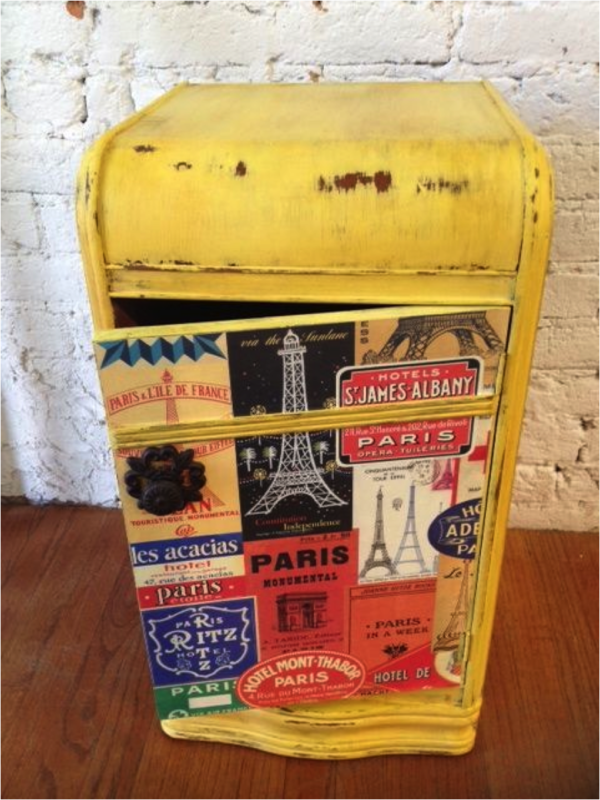 New life and verve was brought to this old side table with cheerful, faux-distressed paint, paper, and new hardware. Expert furniture crafter Dawn Nay of Rule42 walked me through her process. First, we gathered the materials. For this project, Dawn used a piece of new wrapping paper, but you can use nearly any kind of paper. I asked Dawn how she defines “pretty paper” and she explained that anything that appeals can be used. She has used or seen others use old maps, cards, letters, postcards, comics, wallpaper, dress patterns, magazines, sheets of music, and wrapping paper, which she details on Pinterest. The least expensive option, and the one that can lend itself to true personalization and creativity, is to source your paper from the materials you already have. Dawn recommends that you find your paper first, but actually apply it last — after you’ve sanded, primed, and painted your furniture. Choose a complimentary paint color, as shown in these photos, or pull a color from the paper itself for best results. “I recommend using a non-toxic paint, like the line from CeCe Caldwell, if you’re working at home near family or pets,” advises Dawn. 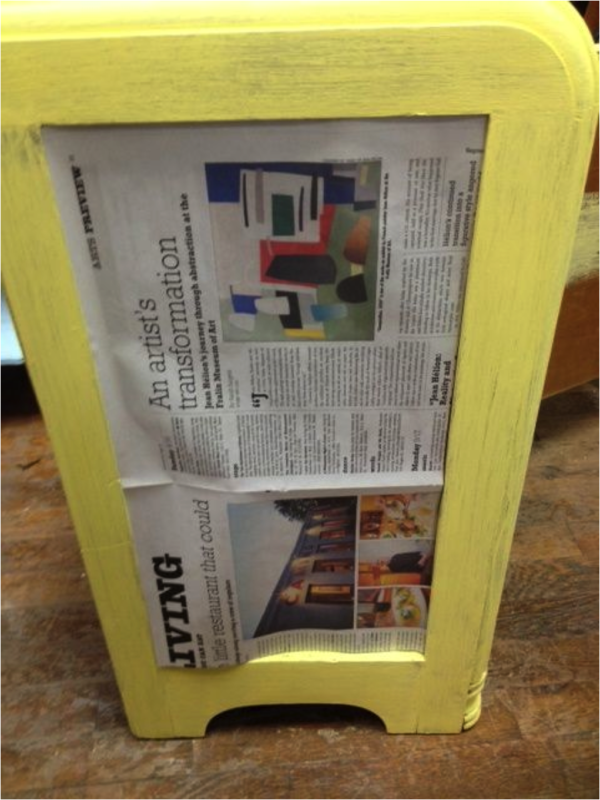 Use discarded newspaper to create a pattern before you cut into the paper you’ll use on your furniture. Next, examine the pattern closely by lining it up with the place you plan to adhere it to. This is particularly important if there is a design feature you want to continue between two parts of the furniture. For example, Dawn wanted to be sure that no words were cut off between the top part of the side table’s door and the section with the new hardware. 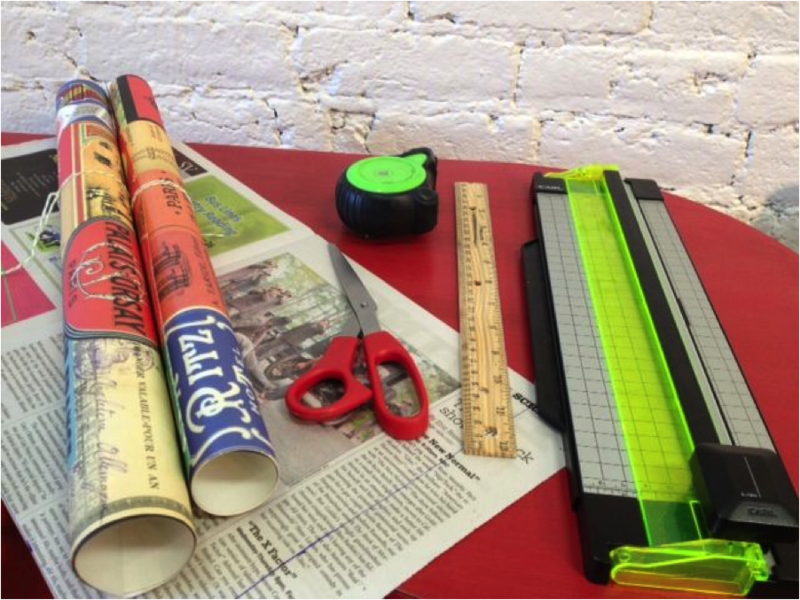 Using your newspaper pattern, measure and cut the paper you will decoupage onto the wood. The easiest way is to lightly trace the front of the paper with pencil. Important: If you prefer to mark on the back of your paper with your pattern, remember to reverse your pattern. “Double-check those measurements because you are getting ready to make it permanent!,” cautions Dawn. Next, brush the decoupage glue onto the back side of the paper and then onto the surface of the furniture. Line the paper up at the top and begin pressing the paper onto the spot smoothing out any air bubbles. It is easiest to push the bubbles out from the center, starting from the top. Depending on the strength of the paper, you might gently press out the air bubbles with the edge of a wooden ruler, but use caution because the wet glue may weaken some paper and cause it to tear. Let this dry for several hours or overnight. You should gently test the surface in an inconspicuous place to make sure it is completely dry. Finally, when it is dry, you’re ready to seal the paper with one or two coats of decoupage glue. “The paper might bubble again as it absorbs the wet glue, but let it be,” says Dawn. Let everything dry completely before putting the furniture back to use. Don’t forget to take before and after pics of your transformation, so you’ve got bragging rights! 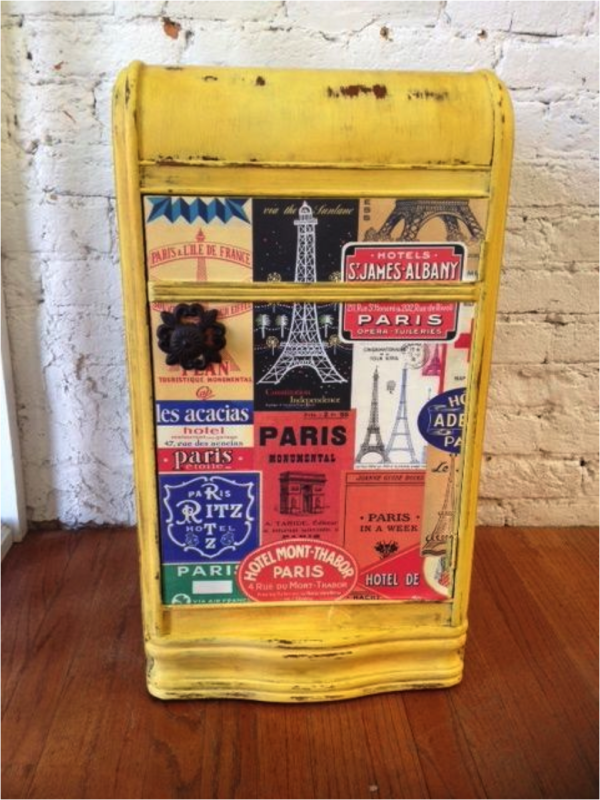 With some careful craft planning, you can easily and inexpensively “upcycle” old furniture into new décor. 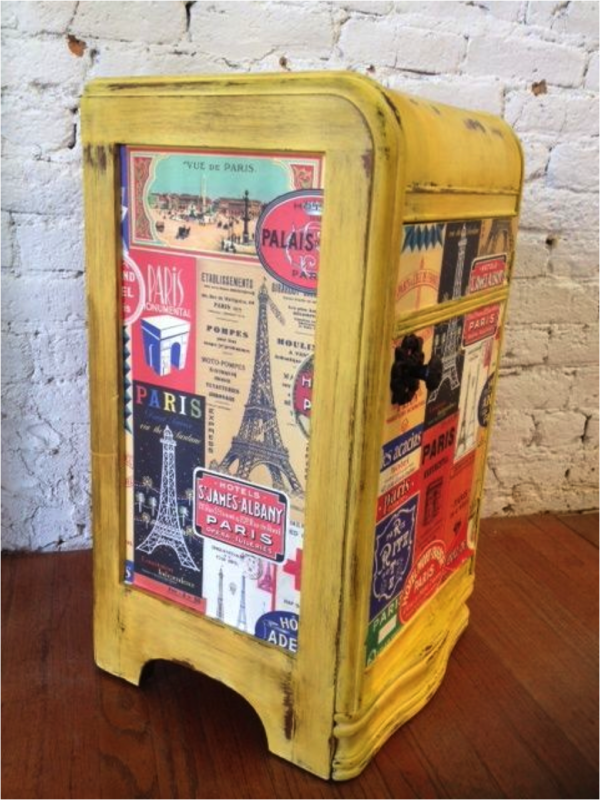 Update nearly any kind of wooden furniture using a combination of paint and pretty paper. Katie McCaskey is a freelance journalist who writes for Vistaprint, a leading provider of customized products, like personalized calendars, mugs, t-shirts and more. Katie is also an author and marketing consultant. Very classy renovation! I am inspired. I like your choice of original piece. Ugly turned into SUBLIME! Thank you for your creativity! I had just met a fellow craftster, Rachel, from Eugene, Oregon yesterday at the Barnes & Noble who informed me about this website! If I do this on a dining table top, is the decopauge enough of a sealer?